31 January 2005 letter to then Chief Justice William H. Rehnquist concerning George H. W. Bush and his likely involvement in the 1963 JFK assassination and cover-up; plus copies of two highly relevant FBI memos; plus photos of a George H. W. Bush look-alike near the door of the Texas School Book Depository moments after the JFK assassination; plus some correspondence on this grave but neglected matter; and finally a timeline to help understand the events described. One wonders what New Orleans District Attorney Jim Garrison could have done with these memos had he been able to introduce them as evidence in his 1968 prosecution of Clay Shaw for conspiracy to murder President John F. Kennedy! Finally, I note that the Talmudic law of the moser, or the law of the Jewish informer, is essentially a covenant prohibiting a Jew from informing on another Jew to a non-Jew, which is diametrically opposed to the adversarial process of our own legal system and therefore conducive toward obstruction of justice. Furthermore, among employees at all levels in our intelligence and law enforcement communities, the law of the moser constitutes an impediment to frank and uninhibited exchanges of information in the discharge of their duties and therefore poses a threat to our national security. I cannot overemphasize the great importance of this very real issue of the law of the moser, or law of the Jewish informer, the history of which you can read online at www.JewishEncyclopedia.com. In my complaint of judicial misconduct docketed under Miscellaneous Number 01-0030 on 1 June 2001 by the Clerk of the United States Court of Appeals, 11th Circuit, I cite a living rabbi's more recent (1997) published article promulgating the law of the moser or law of the Jewish informer. Again, this is a very real issue, not unlike the Mafioso code of omertà. The Warren Commission was oblivious to it. So was the 9/11 Commission. We continue to ignore this issue at our national peril. Let us address in a forthright manner this issue of the Talmudic law of the moser or law of the Jewish informer and its legal, national security and foreign policy implications. The following two sections A & B show verbatim reproductions of the texts of the 29 November 1963 Hoover memo and the 22 November 1963 Kitchel memo. The original copies show time stamps, routing designations, declassification stamps, signatures, handwritten initials and the like, whereas the verbatim reproductions that follow show only the text. Copies of the originals were attached to the letter mailed to Chief Justice Rehnquist. Click here to view scanned copies of the originals. 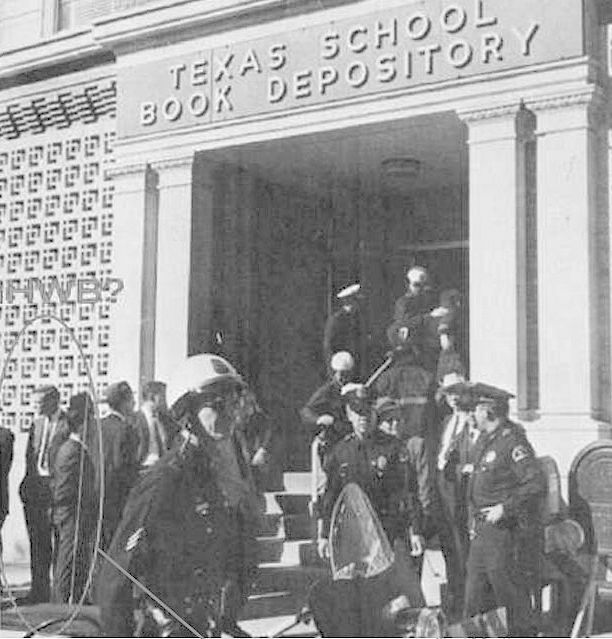 Photo below shows the entrance of the Texas School Book Depository minutes after the assassination of US President John F. Kennedy. At far left stands a man with a remarkable resemblance to George Herbert Walker Bush. FBI agent Graham Kitchel alleges that Bush called from Tyler, Texas around this time. Was Kitchel providing an alibi for Bush? In the subsequent 24 hour period, Bush and Jack Ruby worked feverishly to portray the accused assassin, Lee Harvey Oswald, as a pro-Castro activist, when in fact he had worked with anti-Castro groups in New Orleans in the summer of 1963. Is that young George H. W. Bush outside Texas School Book Depository right after the murder of JFK? Shown below is a close-up of man who looks like George H. W. Bush outside the Texas School Book Depository minutes after the JFK assassination. Superior WASP profile constitutes good grounds for interrogation of Bush, but even though this photo has circulated in the JFK assassination research community for decades, Bush may very well go to his grave without explaining his highly questionable activities in Dallas on 22 and 23 November 1963. This is outrageous! Again, is that young George H. W. Bush outside the Texas School Book Depository right after the murder of JFK? I have been re-reading Russ Baker's book...and your website...and have a question. It appears that H.W. ("Poppy") Bush was, in fact, in Dallas the night before, and during the day of, the Kennedy assassination (note, particularly his photo in front of the TSBD). Yet, it appears that he was also in Tyler, Texas, in the middle of that day. There were witnesses to his attendance at the Tyler Kiwannis luncheon on that day, and there was the SUPPOSEDLY legitimate phone call to the Dallas FBI office from Tyler (an apparent intelligence world "block and bridge" move, to cover himself). Did the Kiwannis people lie (and the phone records were fudged)? Or did Bush--perhaps--witness the murder, grab a cup of java, then pop over to Tyler--via a private plane--to nicely establish an alibi? Of course, there is also the silly letter by Barbara Bush. Thanks again for your email last week. This is my reply to your “slightly more complete” version of your inquiry made on 6 September 2012. First let me deal with the photo. If you would please look more carefully where I posted this photo (www.show-the-house.com/id6.html) you will see that I clearly reference a George H. W. Bush (GHWB) look-a-like shown standing near the entrance of the Texas School Book Depository within minutes of the JFK assassination. I for one do not make the positive identification of this GHWB look-a-like that you seem to make. I do indicate on my webpage the urgent need to interview GHWB concerning this photo and the statements attributed to him in the Kitchel memo. Of course if positive identification is made, then the Tyler scenario falls apart. Now let me get to the other points raised in your query. Where you refer to “H. W. (“Poppy”) Bush” I take it you mean George H. W. Bush, the former President of the United States. You wrote, "It appears that H. W. ("Poppy") Bush was, in fact, in Dallas the night before, and during the day of, the Kennedy assassination." I am not aware of any proof that GHWB was in Dallas the night before our president was slain. Russ Baker makes the supposition that GHWB was in Dallas the night before. He might be right. But he offers no evidence whatsoever. Worse, on top of this supposition he stacks another supposition; namely, that GHWB misled Kitchel about his intent to stay at the Sheraton-Dallas on Friday night (22 November) so as to sow confusion and hide for whatever reason his putative Thursday night (21 November) stay in Dallas. (See page 59 of Russ Baker’s Family of Secrets) This is a very far-fetched explanation and conclusion. You also wrote of GHWB, "Yet, it appears that he was also in Tyler, Texas, in the middle of that day. There were witnesses to his attendance at the Tyler Kiwannis luncheon on that day." There are only two known witnesses to GHWB’s presence in Tyler when news of the murder of JFK broke, and only one of his being at the Kiwanis luncheon there. GHWB’s wife Barbara recollects being in Tyler with her husband GHWB in her memoir. (See pages 59 and 60 of Barbara Bush: A Memoir) Barbara Bush does not mention Kiwanis at all. We get that from Kitty Kelley, who interviewed the then vice-president of Kiwanis in Tyler, Aubrey Irby, on 11 September 2002, an anniversary day when protecting the Bush name could easily be conflated with defending our national security and sovereignty. (See Kitty Kelley’s The Family, pages 212 and 213 and the notes for Chapter 12 on pages 646 and 647) And since we know from the author Joseph McBride that in the mid-to-late 1980’s (well before the 1993 declassification of the Kitchel memo) GHWB and his staff lied repeatedly to him about GHWB’s whereabouts on 22 November 1963, and about the identity of the “George Bush of the CIA” mentioned by FBI Director J. Edgar Hoover in his 29 November 1963 memo, Barbara Bush’s intimate association with GHWB and his staff makes her testimony in this matter worthless. As you yourself wrote, "Of course, there is also the silly letter by Barbara Bush." Indeed! Where you wrote, "and there was the SUPPOSEDLY legitimate phone call to the Dallas FBI office from Tyler, an apparent intelligence world "block and bridge" move (to cover himself)," let me make one correction and three comments. The call went to FBI agent Graham Kitchel in Houston, not Dallas. One, I am not aware of any standard investigative procedures vis-à-vis phone records in this matter. So here we can only speculate. (Speculation can get as wild as Hoover’s having concocted a fake record of such a call to have a card to play against the CIA) Two, we must remind ourselves that in 1963 nobody had heard of the Freedom of Information Act and therefore individuals engaged in a high level conspiracy could proceed with perfect confidence that their actions would be above and beyond scrutiny. Three, the term “block and bridge,” which I first learned from Russ Baker’s 2009 book, has more to do with public relations or damage control after an unwelcome fact has already surfaced in the public domain than to clandestine arrangements made in a confidential call from an intelligence operative to an agent of the FBI. Where you wrote, "Did the Kiwannis people lie (and the phone records were fudged? Or did Bush--perhaps--witness the murder, grab a cup of java, then pop over to Tyler--via a private plane--to nicely establish an alibi?" Let me repeat: There are no “Kiwannis people” but just one Kiwanis person, Aubrey Irby. There are only two known Tyler witnesses, Barbara Bush and Aubrey Irby. Neither impresses me as a reliable witness, especially when phone records, Kiwanis records, hotel records, and airport flight records have not been checked to verify what these witnesses have said. Here is my theory. And I repeat the word “theory,” which must be ruled in or out. GHWB was inside the Texas School Book Depository before, during and after the JFK assassination. He was working from afar with CIA Counterintelligence Chief James Jesus Angleton, who maintained an active CIA file on Lee Harvey Oswald at the time. 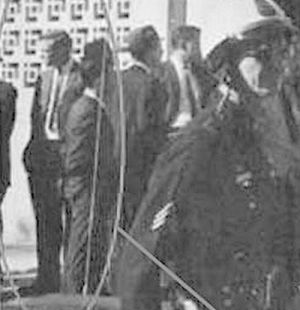 GHWB was there to tie up the pay phone so that Oswald could not use it after the shots had been fired and he sensed betrayal. Then after Oswald left the building GHWB made the call to FBI agent Kitchel in Houston. The real message between the lines to Kitchel was to establish GHWB’s contact point that evening at the Sheraton Dallas Hotel. Around this time GHWB may well have been the mystery person who made the call that first fingered and described Oswald. For the rest of the day and into the night, GHWB was busy in his patrician way making sure the false and misleading public persona of Oswald would be established as fact. According to Warren Commission Hearings depositions that I have read, Jack Ruby was also busy in Dallas where he was lining up sound-bite interviews of District Attorney Henry Wade by news media personnel whose friendship he had cultivated with white paper sacks of corned beef and pastrami sandwiches with pickles and celery flavored soda from the local deli. At a late night press conference at Dallas Police Headquarters Ruby openly interrupted and contradicted District Attorney Henry Wade who had initially and correctly said that Oswald was associated with anti-Castro groups. Wade immediately accepted Ruby’s blunt assertion that Oswald worked with a pro-Castro group as though Ruby was an acknowledged authority on the subject. Of course GHWB was also heavily involved with anti-Castro groups. And Hoover’s 29 November 1963 memo that mentions “George Bush of the CIA” dovetails nicely with this theme by indirectly ratifying Oswald’s false “pro-Castro” public persona. Taking a step back in order to strive for objectivity and balance, the GHWB Dallas scenario greatly outweighs the Tyler scenario in importance. Barbara Bush’s 2004 memoir rules out the GHWB Dallas scenario entirely. So does Kitty Kelley in her 2004 book. My 2005 letter to Chief Justice Rehnquist is the first attempt to “go there.” Russ Baker’s 2009 book is the only known effort to “follow there,” but in a clumsy way that obfuscates. He is deeply skeptical of Barbara Bush’s “Dearest Family” letter supposedly written on the day of the JFK assassination, yet he accepts her version of events describing Dallas as a brief stopover on the way back to Houston and not an overnight destination for her husband GHWB as explicitly stated in the Kitchel memo. GHWB and Jack Ruby working in Dallas on Lee Harvey Oswald’s false public persona is a taboo subject because of its vast and dangerous implications. Russ Baker is steering people in another direction, as though in concert with Barbara Bush and Kitty Kelley. The individual efforts of Barbara Bush (1994), Kitty Kelley (2004) and Russ Baker (2009) to handle the problem of the GHWB-in-Dallas scenario as per the 22 November 1963 Kitchel memo (declassified in 1993) all lack at least one element of Russ Baker’s definition of “block and bridge.” On the other hand, and by way of contrast, and as a virtually unknown researcher and writer, the element of surprise has worked in my favor. My 2005 letter to Chief Justice Rehnquist was, in the space of about three days, faxed to every member of Congress, both in the Senate and House, and at all their offices, both at home and in Washington. It was also faxed to nearly every embassy in Washington and mission to the United Nations in New York, as well as many other individuals and institutions in the public and private sectors. I’m sure this letter shocked people. Yes, it was quickly forgotten. But I’m on record, and Russ Baker’s book seems to me a weak attempt to refute my letter to Rehnquist without referring to it or naming me or otherwise acknowledging my unique and original and searching handing of the subject matter. It was an important exercise for me to gather my thoughts on this long-neglected topic. So I thank you for making this the opportunity to do so. I don’t have all the answers. My memory needs refreshing. But I am determined, if there is still time, to find these things out. Copy to US Senate Foreign Relations Committee et al. Greetings from San José, California, from a private citizen of the USA who hopes that a thaw in relations between the USA and Cuba will be the occasion to complete some unfinished business regarding the assassination of our beloved president, John Fitzgerald Kennedy. You will remember your having thrown Meyer Lansky and the Mafia out of Cuba at a time when Director of the Federal Bureau of Investigation, John Edgar Hoover, denied that the Mafia existed even as he met regularly with Frank Costello. Frankly, Lansky had loyalty to the Zionist state, and JFK was adamantly opposed to the Zionist nuclear weapons program. So Lansky’s motives went deeper than loss of casinos and a failed invasion. My fellow Americans still boast of a free and open democracy, but in 1988, when they elected George H. W. Bush to be our president, they were totally in the dark about his presence in Dallas, Texas, on 22 November 1963, the day JFK was murdered! Two FBI memos suggest why he was there. An FBI memo dated that very sad and unforgettable day, which was declassified on 15 October 1993, finally revealed this important information about Bush when it could no longer be used to ascertain his suitability for our nation’s highest office. George H. W. Bush was truly a stealth candidate! Moreover, the declassification and release of this document (called the Kitchel FBI memo) was done very quietly, and thereby afforded Barbara Bush the opportunity to concoct an alibi for her husband that appears in her memoir published less than a year later in 1994. This Barbara Bush “Dearest Family” alibi was notably missing six years earlier, in 1988, when presidential candidate George H. W. Bush and his staff used lies and evasions to fend off inquiries about his being the “George Bush of the Central Intelligence Agency” mentioned by FBI Director John Edgar Hoover in his memo dated 29 November 1963. Hoover’s memo strongly reinforces the false public persona of Lee Harvey Oswald as a “pro-Castro” provocateur. It was Jack Ruby who first established this false public persona of Oswald at a press conference in Dallas on the night of 22 November 1963, and it was George H. W. Bush who, according to Hoover’s memo, was advised on this matter by the FBI the next day, 23 November 1963. It was George H. W. Bush who had advised FBI agent Graham Kitchel earlier that day that he would be staying at the Dallas Sheraton Hotel on the 22nd and 23rd of November 1963, as we know from Kitchel’s memo of Bush’s call. This Kitchel memo came to my attention in 2003, a whole decade after its declassification and release. I first read about it on the Internet, then obtained my own copy by mail from the National Archives. Even today, the vast majority of Americans remain ignorant about this memo and its vast implications. Our “free” press refuses to inform them! In 2005 I wrote an open letter to then Chief Justice William H. Rehnquist and his colleagues in which I expressed my concern about the handling of the Kitchel memo, and how it helps interpret Hoover’s memo, and how it might be evidence of framing Lee Harvey Oswald and of obstructing justice in the unsolved murder case of JFK. A copy follows in this email. Copies were sent by fax broadcast to every member of the US Congress, every embassy in Washington and every mission to the United Nations in New York City where I lived at the time. Also, a copy of my letter to Chief Justice Rehnquist was published on my private website at http://www.show-the-house.com/id6.html. Yet nothing was done despite replies from several US Senators. And so a decade after my letter to Rehnquist, as you hear calls for a free and open democracy in Cuba, kindly let me suggest that you allay the fears of Senator Marco Rubio and his ilk, that the USA won’t get “anything in return” in a deal between Cuba and the USA, by calling for a free and open democracy in the USA. In particular, a call for George H. W. Bush to address the nation concerning issues raised by the Kitchel and Hoover memos will help Americans face the future by illuminating past events that have set our nation way off course. The USA must lead only as a sovereign equal among sovereign equals according to international law and treaty obligations. Instead of dividing and conquering in order to impose a so-called new world order, the USA must look within for the root cause of its rampant full spectrum fraud and force. Please raise your voice for truth and justice for JFK! I tried contacting you back on 18 February 2015 as you can see below. This morning I found on the CBS News website an article about your private email server which included the email address jeb@jeb.org. So, I try again in the hope that you will answer. My goal is to establish historical truth and pursue justice in the murder case of JFK, nothing more & nothing less. Today’s news reports prompt me to contact you. (I found the above email address on the Live Free or Die website.) If indeed you are “my own man” with respect to your rather unique family background, let me challenge you by asking you to confront a major problem concerning your father and the official account of the JFK assassination. Basically, what I am hoping to achieve is your father’s own answers from his own mouth to questions that arise from two declassified FBI memos. The pertinent issues are raised in my recent letter to Fidel Castro Ruz, and in an earlier 2005 letter to then Chief Justice William H. Rehnquist, copies of which follow in this same email to you. I thank you in advance for your attention to this matter and look forward to your response. Greetings from beautiful San José, California, and congratulations on your electoral victories in Florida, Illinois and North Carolina! Your momentum is great, but you still need to put the war-mongering Establishment in its place. Please let me suggest a course of action for you to take to achieve this objective. There is still some unfinished business to take care of with regard to the 22 November 1963 assassination of our beloved President John FitzGerald Kennedy. Two FBI memos strongly suggest that former president George Herbert Walker Bush was in Dallas on the night of 22-23 November 1963 where he worked with Jack Ruby to promote a false public persona of the accused “patsy” Lee Harvey Oswald. Scans of these two FBI memos (dated 22 and 29 November 1963) are published on my private website at www.show-the-house.com/id46.html. Also, my interpretation of these memos is spelled out in my January 2005 letter to then Chief Justice of the United States William H. Rehnquist, which is published at www.show-the-house.com/id6.html. My letter mailed to Rehnquist and his colleagues was simultaneously faxed to every member of the United States Congress, both Senate and House, to every embassy in Washington, DC, and to every mission to the United Nations in New York, as well as to many other organizations and individuals, public and private, including the news media. I had about twenty replies, including from Senators Obama of Illinois, Nelson of Nebraska and Graham of South Carolina, but in the end, all avenues for follow-up were blocked. The reply from Obama was a letter from an assistant named Mason, but any hope for results soon faded. Now it so happens that President Obama will soon visit Cuba; however, he will not meet with the man who has been falsely accused of being behind the JFK assassination, Fidel Castro. All things considered, the timing would be perfect for you to use your incomparable media access to call for accountability directly from George Herbert Walker Bush regarding the above-mentioned FBI memos. Bush has been riding in a protective bubble regarding these memos, and there is a conspiracy of silence about this very serious matter inside government and the news media. In my opinion, Sir, you are that rare person who can openly call upon Bush to account for his actions and at the same time shame the two-party Establishment for its cover-up. Most importantly, you can establish historic truth and maybe even pursue justice in the unsolved crime of murder of our president. So, Mr. Trump, please lift your voice for JFK! If I can be of further assistance in this matter, please contact me or have one of your representatives contact me at the email addresses below. Please convey to our former President of the United States George H. W. Bush my prayers and best wishes for his recovery and many more years to live. Also, let me take this opportunity to renew my request that Mr. Bush explain to me and the people of the USA and, indeed, of the world, the Graham Kitchel and J. Edgar Hoover FBI memos relative to the assassination of former President of the United States John FitzGerald Kennedy. Photocopies of these memos appear on my private website along with my 31 January 2005 letter to then Chief Justice William Rehnquist, which you will find at www.show-the-house.com/id6.html. I know that many other Americans who are apprised of these FBI memos – thanks to the Internet and despite the mainstream news media’s blackout -- would very much like to hear an explanation of them from George H. W. Bush’s own mouth. Barbara Bush’s alibi given in her Barbara Bush: A Memoir is suspect. The whole situation does not look good for our country. Let’s have the truth, and set us free! Thank you in advance for your attention in this very important matter. President of the United States John F. Kennedy is assassinated in Dallas, Texas at 12:30 PM local time. Although he was instantly killed to a medical certitude by a shot to the head, he was not pronounced dead until 1:00PM at Parkland Memorial Hospital. FBI Agent Graham Kitchel writes memo of a call at 1:45 PM local time from “George H. W. Bush” who said he was in Tyler, Texas and who declared his intention to stay overnight 22-23 November 1963 at the Sheraton Dallas Hotel. (This memo would remain classified for nearly 30 years.) At a press conference late that evening, Jack Ruby corrects District Attorney Henry Wade and thereby creates the false public persona of the accused assassin Lee Harvey Oswald as a pro-Castro activist. Jack Ruby kills the accused assassin of President Kennedy, Lee Harvey Oswald, whom Texas State Attorney General Waggoner Carr later revealed to be an FBI informant (ID#S0179) being paid $200 a month. FBI Director J. Edgar Hoover writes a memo on the possible repercussions of the JFK assassination within the Cuban-American community, which confirms Jack Ruby's pro-Castro news media spin on Oswald, and declares that the contents of this memo were “orally furnished to George Bush of the CIA”; President of the United States Lyndon B. Johnson issues an executive order that establishes the Warren Commission. Chief Justice of the United States Earl Warren deposes Jack Ruby. Publication of the Warren Commission Report. New Orleans District Attorney Jim Garrison establishes that Lee Harvey Oswald worked with anti-Castro groups within the intelligence community in New Orleans where he was “sheep-dipped” to take on the guise of a pro-Castro agitator. Garrison was clueless about the Hoover and Kitchel memos. His 1970 book, A Heritage of Stone, is essentially an indictment against the US government and the mass media for obstruction of justice in the JFK murder case. United States House Select Committee on Assassinations concludes that President Kennedy was very likely assassinated as the result of a conspiracy rather than by "a lone nut." The 29 November 1963 Hoover memo is published for the first time by Nation magazine and elicits lies and evasions from Vice President of the United States -- and Republican candidate for President -- George H. W. Bush and his staff and advisors. Bush could not remember his whereabouts when JFK was killed, and his wife Barbara did not help him with her own recollections based on her "Dearest Family" letter of 22 November 1963 which surfaced in her memoir published in 1994, less than a year after the release of the Kitchel memo necessitated an alibi for her husband. On a personal visit to FBI Headquarters in Washington, DC I obtain a copy of Hoover’s 29 November 1963 memo. Publication of Mark Lane’s Plausible Denial, which contains a copy of the 29 November 1963 Hoover memo. Release date of JFK the film, which has an enormous impact around the world. Zionist money keeps the focus on the CIA as the perpetrators and ignores Zionist motive to remove JFK on account of his opposition to their nuclear weapons program. Publication of CIA Officer Robert Morrow’s Firsthand Knowledge, which also contains a copy of the 29 November 1963 Hoover memo. The Assassination Records Review Board is established by law and then works to collect and preserve evidence pertaining to the JFK assassination for public scrutiny. As the deadline fast approached, I hand deliver to the Clerk of the Court of Appeals for the 2nd Circuit complaints of judicial misconduct (93-8533 and 93-8534) after a phone conversation with the clerk’s office revealed that the complaints that I had mailed weeks before could not be found. One of the complained of judges was John Walker, a cousin of George H. W. Bush, who had appointed Walker to the appellate bench. Judge Walker did not recuse himself in my “frivolous” appeal of a “frivolous” lower court case that touched on the matter of George H. W. Bush and the Kennedy assassination. The Graham Kitchel FBI memo of 22 November 1963, which reports a call from “George H. W. Bush” who said that he was in Tyler, Texas and who declared his intention to stay overnight 22-23 November 1963 at the Sheraton Dallas Hotel, is declassified. The news media blacks out the Kitchel memo, but it slowly spreads on the Internet. Publication of Barbara Bush: A Memoir, which states that she and her husband George H. W. Bush left Tyler by plane and made brief stopovers at Fort Worth and Dallas before proceeding directly to Houston, Texas on the afternoon of 22 November 1963. This alibi for her husband was not used in 1988 when he was under scrutiny for his activities and whereabouts the day JFK was murdered. Not until release of the Kitchel memo in 1993 was there a need for an alibi. Publication of Kitty Kelley’s The Family, which repeats Barbara Bush’s assertion that she and her husband George H. W. Bush went back to Houston on the afternoon of 22 November 1963. Kelley refers to the Kitchel memo in the notes, but does not give the text and does not entertain the scenario of George H. W. Bush in Dallas on 22-23 November 1963. My letter to Chief Justice of the United States William H. Rehnquist, which explores the scenario of George H. W. Bush in Dallas on 22-23 November 1963, and how it jibes well with the Kitchel memo of 22 November 1963, the Hoover memo of 29 November 1963, and the efforts of Jack Ruby to promote the false and misleading public persona of Lee Harvey Oswald as a pro-Castro provocateur, is mailed to him and his colleagues on the Supreme Court and then faxed to every member of the US Congress, every embassy in Washington, every mission to the United Nations in New York, and to many other individuals and institutions in the public and private sectors. Publication of Russ Baker’s Family of Secrets, which accepts Barbara Bush’s recollection that she and her husband George H. W. Bush returned to Houston, Texas on the afternoon of 22 November 1963 despite his having expressed strong skepticism of Barbara Bush as a reliable witness. To the best of my knowledge and belief, Baker's Family of Secrets is the first book to publish the text of FBI agent Graham Kitchel's 22 November 1963 memo. But Baker strains credulity in a vain attempt to dismiss the scenario of George H. W. Bush's overnight stay in Dallas on 22 and 23 November 1963. George W. Bush and George H. W. Bush violate custom and do not attend the Republican National Convention at which Willard Mitt Romney accepts nomination as Republican candidate for President of the United States.